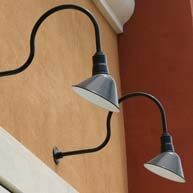 At Sign Bracket Store, we know the right outdoor lighting improves the presence of a business façade around the clock. Our exterior sign lighting and stylish gooseneck lights give businesses, storefronts and warehouses a warm, welcoming personality, day or night. 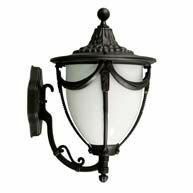 Find goosenecks and other architectural lighting fixtures, including sign flood lights and spot lights. Most of our outdoor sign lighting is made from high-quality aluminum that is powder coated for extra protection. All types of architectural lighting and exterior sign lights, brought to you by Sign Bracket Store, come in various shapes and sizes to suit an array of projects. Shop online to find attractive outdoor sign lighting in a range of styles, from eye-catching radial shades to more functional CFL and LED flood sign lights. 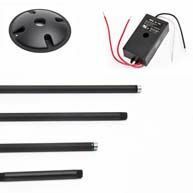 Our collection of outdoor lighting products are primarily made from corrosion resistant aluminum that is finished with a powder-coated paint for extra protection. Additionally, brass and copper fixtures add an upscale element to your lighting scheme. Whether you need a single spot sign light to illuminate a small hanging blade sign, or large fluorescent flood lights that can blanket an entire storefront façade, Sign Bracket Store can accommodate your lighting project. Our UL approved sign lights and other architectural lighting satisfies a range of applications, both inside and outside. 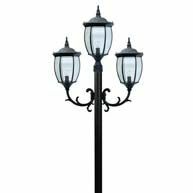 For coordinating alleyway or street lighting, check out our collection of decorative lamp post lights. Effective outdoor sign lighting with gooseneck style spot lights can be accomplished with just one fixture for a small sign. For larger signs, group as many as 10 sign lights side-by-side for a more brilliant effect. Gooseneck sign lights come in many sizes, lengths and shade reflector shapes. Sign light reflector shades are also available with straight or angled reflectors and custom necks and holes can be created for most any of our outdoor sign lighting designs. 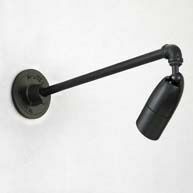 For custom commercial gooseneck lighting, one of our project managers can assist via phone. 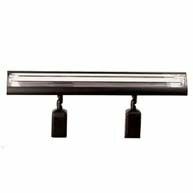 All are UL approved sign lights, meaning fixtures are UL Listed for safety and performance. Sign flood lights and monument sign lighting are a natural offering, given Sign Bracket Store's large assortment of signage supplies, also available online. In addition to industrial lighting our website features a number of other sign related products like banner brackets, lamppost hanging basket brackets, A-Frame signage and roadside signage. Sign Bracket Store by Hooks & Lattice is based in Carlsbad, California just 40 miles north of San Diego and 40 miles south of Orange County. Incorporated in 2001, Hooks and Lattice proudly sells sign lights and other products throughout the United States.